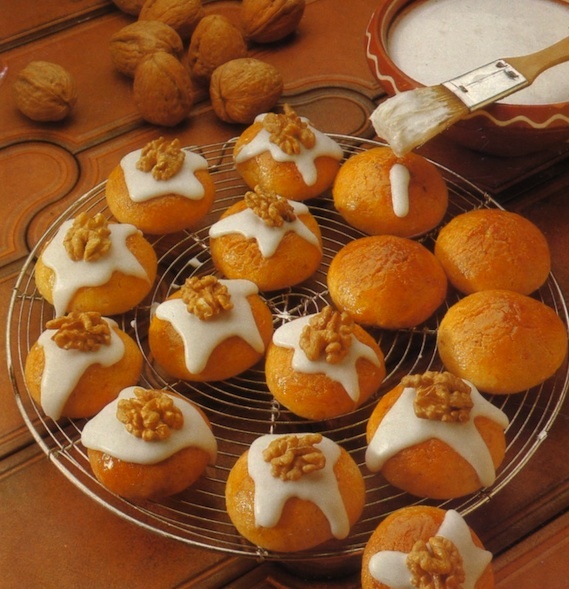 In Germany we use walnuts for many baking recipes. The German Christmas Cookies Walnut Cookies are easy to make. This is the season for walnuts now and you can get them in almost every super market. Tip: If you cannot get ground walnuts use a coffee grinder to grind them. Happy Baking! - Whisk very soft butter with powdered sugar, egg yolks, egg, vanilla sugar and salt until bubbly. - Add walnuts and mix in flour. - Form balls of walnut size and place them on a greased baking tray or layered with parchment paper. - Bake them in preheated oven for 20 minutes at 325 F.
- Press apricot jam through a sieve, and with a brush or a small spoon spread it over the cookies when they are still warm. - Mix powdered sugar with water and with a brush add it on the cookies after the apricot jam has dried a bit. - Place half of a walnut on top (it should stick).